IMO Dropbox is still better. Moreover SkyDrive - released yesterday - is better too! Excellent news! Except for the new pricing. 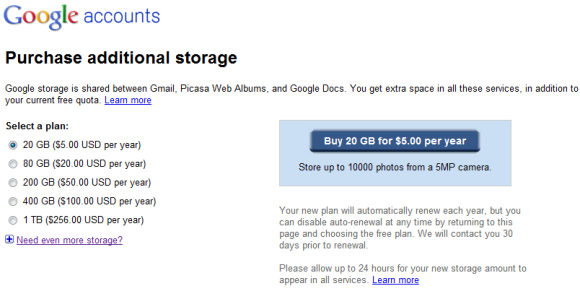 So, does it mean that Picasa and Google Drive share the 5GB? "now you need to pay $2.49/year (almost $30/year) for 25 GB, instead of $5/year for 20 GB"
Hope so, $30/year is way too much..
looks like they're not kidding, I tried to buy more storage (25GB), and at checkout it still said "monthly". Actually SkyDrive is only offering 7GB free for new users. But the paid data storage is cheaper on SkyDrive (at least in the UK). Those with an existing SkyDrive account (anybody with a Windows Live account) can keep their free 25GB, but you need to claim it otherwise it'll go down to 7GB at some point. My initial impression is lots of problems, and lots of confusing stuff. 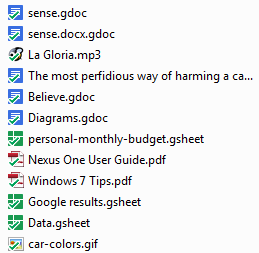 For example, in my new 'Google Drive' folder there are lots of files in the root. At first I figured these must be files that weren't labelled (or whatever it is called now), but that is not the case. I really can't figure out why they are there (in the root). Providing an SDK that allows other web apps to be used with Google Docs is a great idea, but sync'ing Google Docs to my PC's folders is a bad idea - it is going to end up being too complicated for users. "...files are so 1990". How about "...working with many third-party developers so you can do things like send FAXES...", Do they realize that fax machines are from the stone age? Can someone explain this part to me on the Old vs. new storage plans? Does this mean that if we don't touch anything, but have our payment information intact, the same plan (for me it's 20GB/5$/year) remains? 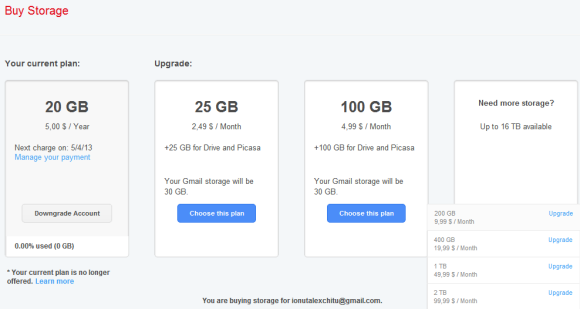 But can you use the old 20GB/5$/year storage with Google Drive? Interesting that also today I got a notice from Microsoft that they will continue my FREE 25 GB of storage on Skydrive. Plus, in Windows 7 I get a folder on my desktop to drop in files. By comparison, Google appears to be wiping out the 80 GB of storage I've been paying for. Worse, Gdrive is not ready for prime time. I got a button that said my drive "isn't ready yet." I'm guessing rollout could take weeks. Chalk one up to Microsoft over Google. Photos storage still seems very uncertain. Picasa brand is still there, but the link on the black bar is to "Photos" which leads to my Picasa stored photos in the Google+ interface. It would make much more sense for photos to be in Google Drive, with the option of sharing folders with my Google+ profile. No Linux support? I guess I'll be sticking with DropBox. Is this the same gdrive code named 'platypus'? As far as I understood, Google Drive is just the Google Docs' Documents list with Dropbox-esque feature and integration with 3rd party apps. 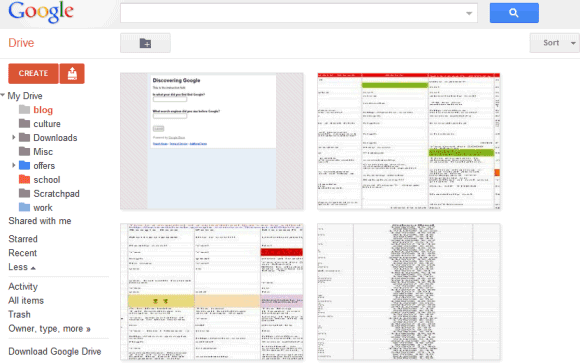 This is actually good, separating Google Docs list from Google Docs editor. 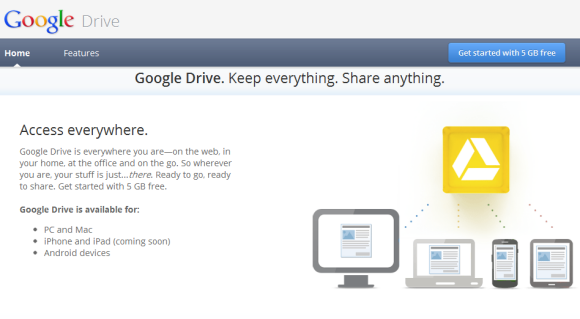 My dear, my linux users can not enjoy this Google drive. but I want to try this service from another device. "who killed the Google Docs project back in 2008. " I think the typo gremlins struck again. That must have been "Google Drive". 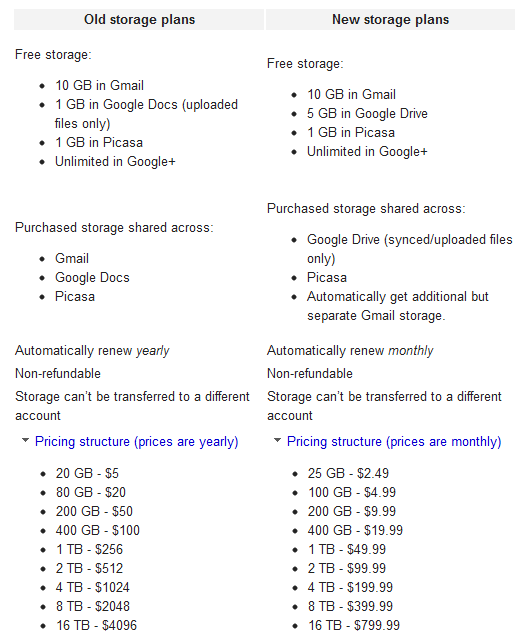 So, my Google Docs page got more complicated, the web space for my Picasa photos got more expensive and, as a Linux user, I still need Dropbox to drag and drop things I want shared on all my machines? After all the waiting, I have to say I am a little disappointed. The docs spage didn't get more complicated, it just got more features. "the desktop app creates a new folder for Google Drive, downloads all the files uploaded"
Downloads all the files? Is that correct? I don't want to have hundreds of files in my computer but only the ones I choose to sync. Isn't possible? is it still possible to upload files and have them converted to google docs format and have unlimited space? With more of these services coming up everyone is going to have files all over the place. Services like Primadesk will be even more important. You can effortlessly copy files from one service to another and search across all the services. Pixlr is not installed by default, you probably had it installed in chrome already and because of that got it in google docs as well. I have an issue with authentication. If I access the drive web page by clicking from the tray icon, I am immediately logged in, and from there I can access all other google services (gmail, etc...). Logging out of gmail is useless: I can "log in" again without authentication from the google drive tray icon.